This is a small scale lino printed on handmade paper in black. I have included a photo of the back of the print because it shows some remnants of text from the scrap paper that the handmade paper was made from. It is also available in blue on handmade paper and in grey or purple & black on Surrey cartridge paper. Number 3 of 7. 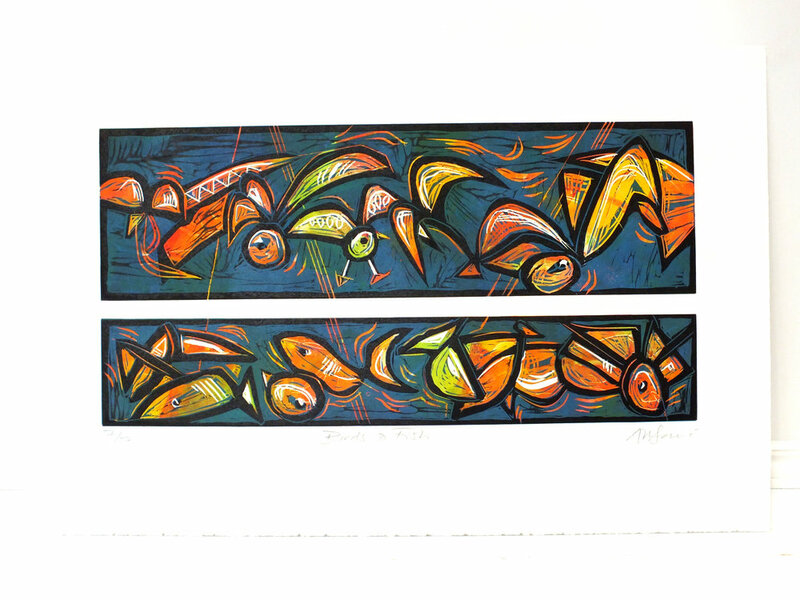 Inspired by Paul Klee, this is a limited edition linocut based on a drawing that I did of imaginary birds and fish. I used small rollers to ink up the shapes in a multitude of colours, before adding the blue sea and sky. The black outline was the final colour. This is print number 3 from a limited edition of 7, printed on archival quality Zerkall paper. Number 3 print is slightly different in colour to numbers 5 and 7. Number 5 of 7. Inspired by Paul Klee, this is a limited edition linocut based on a drawing that I did of imaginary birds and fish. I used small rollers to ink up the shapes in a multitude of colours, before adding the blue sea and sky. The black outline was the final colour. This is print number 5 from a limited edition of 7, printed on archival quality Zerkall paper. Number 5 print is slightly different in colour to numbers 3 and 7. Number 7 of 7. Inspired by Paul Klee, this is a limited edition linocut based on a drawing that I did of imaginary birds and fish. I used small rollers to ink up the shapes in a multitude of colours, before adding the blue sea and sky. The black outline was the final colour. This is print number 7 from a limited edition of 7, printed on archival quality Zerkall paper. Number 7 print is slightly different in colour to numbers 3 and 5. 'Blue' was a gorgeous family pet, with a big heart and huge floppy paws to match. He was cheeky and bright. He is about to jump in this print and then dash around like a child. 'Blue' lived on a small island near France called Jersey, which is part of Great Britain. A Peacock Butterfly with a twist of Pink, this is a delicate and detailed original linocut print in 3 colours with a bright yellow background. 'Butterfly #4' is hand printed on Zerkall archival quality paper using the reduction method with only 1 in the edition this is a wildlife lover's delight. A Peacock Butterfly with a twist of Pink, this is a delicate and detailed original linocut print in 3 colours with a orange background. 'Butterfly #5' is hand printed on Zerkall archival quality paper using the reduction method with only 3 in the edition, this is a wildlife lover's delight. Limited Edition. A charming signed linocut of flamingoes against the backdrop of a waterfall, in 4 colours on good quality cartridge paper. 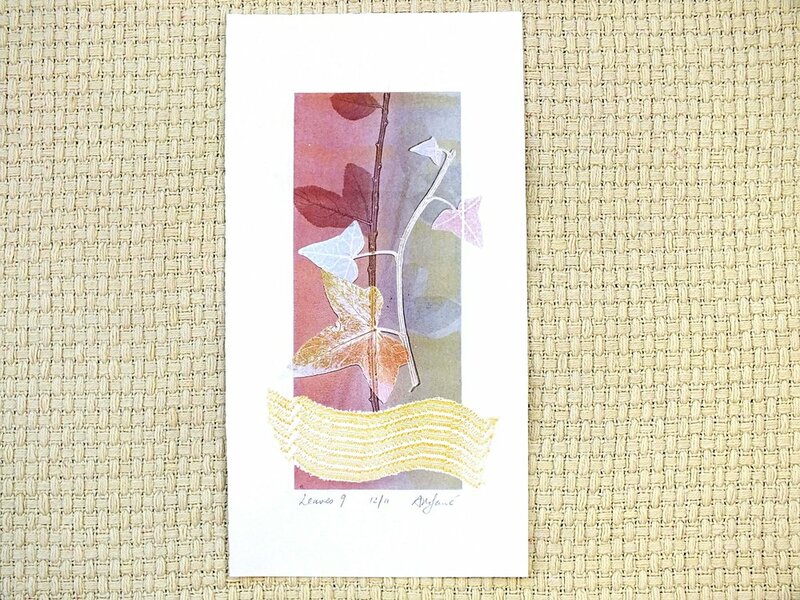 To create this monoprint I used real pressed leaves and fabric, inked them up, inked up a metal plate and ran it through the press. Previous impressions of ivy leaves can be seen in the background. 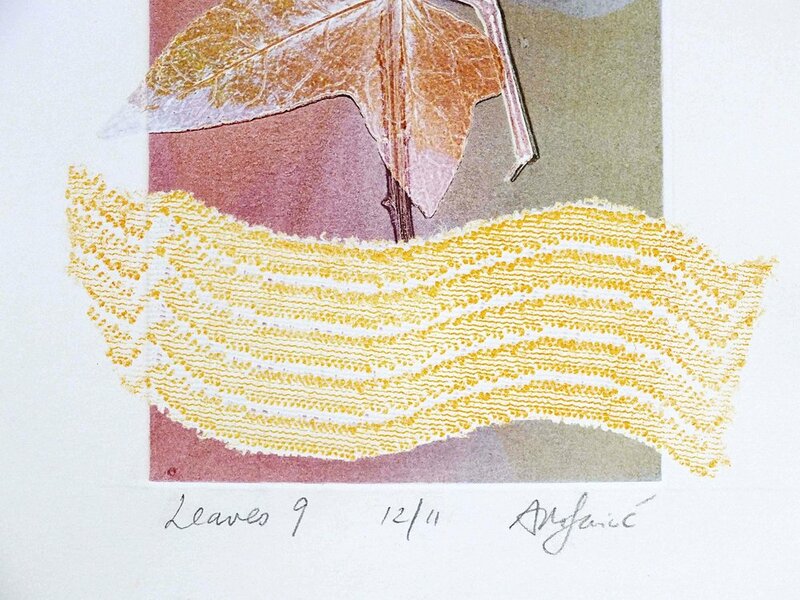 'Leaves #9' is completely original, printed on good quality Surrey cartridge paper. Delicate and decorative butterflies based on a Small Tortoiseshell, A Large Blue and a Peacock Butterfly. These butterflies are in a formal Victorian type display, caught in a square and placed in a row! A simple and original monochrome linocut print signed by the artist, printed on cartridge paper. A noticed a swan hiding away behind a willow branch at Exeter Quay in Devon, England. I watched it for a few minutes as it gradually settled down for a nap. I took a photo just before it tucked it's neck under to sleep. 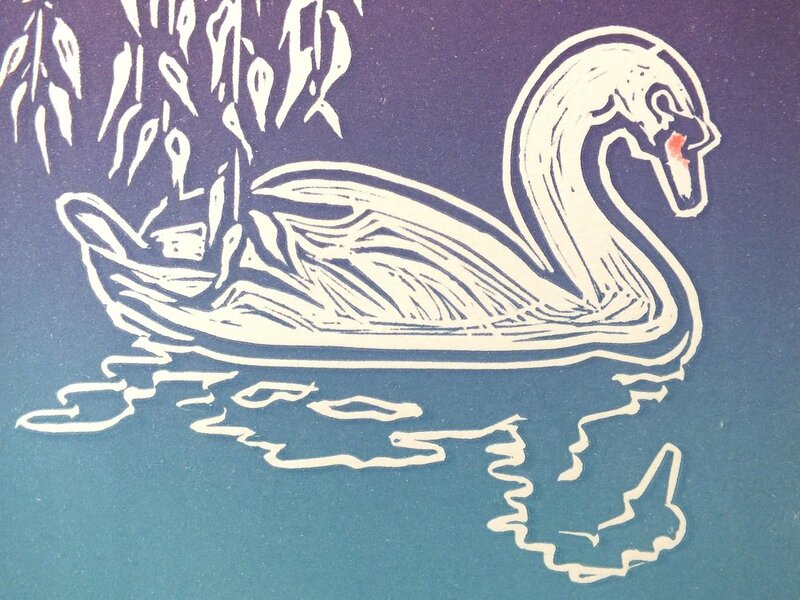 This is a small scale lino printed on 'Surrey' cartridge in a graduated purple and blue. The touch of red is watercolour. This print isn't signed or titled. Yellow Butterfly linocut is printed in black and acid yellow on archival quality Zerkhall paper. This small scale relief print is signed by the artist in pencil.